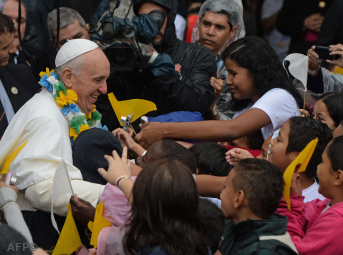 Today Pope Francis visited one of Rio de Janeiro’s favelas—or shanty towns—in an event that he personally added to his World Youth Day 2013 itinerary. He was met by residents of the Manguinhos favela’s Varginha community at the local parish church and then at a nearby soccer field. After a greeting from a married couple who live in Manguinhos, Pope Francis delivered the remarks below, translated by Vatican Radio.